The PicoScope 2104 and 2105 are portable handheld oscilloscopes that are ideally suited for use by hobbyists, students, technicians, and anyone looking for an easy-to-use, affordable, single-channel PC oscilloscope. The small size of PicoScope handheld oscilloscopes makes them ideal for portable use, while still including the powerful features normally found in larger oscilloscopes. The PicoScope 2105 has a 100 megasample per second real-time sampling rate. For repetitive signals the sampling rate can be increased to 2 gigasamples per second using digital equivalent-time sampling. These high sampling rates combined with a 24,000 sample buffer memory and 25 MHz analogue bandwidth make the PicoScope 2105 suitable for a wide range of trouble-shooting tasks on both analogue and digital circuits. 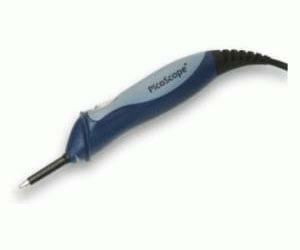 The entry-level PicoScope 2104 is also available for use in less demanding applications.